Scientists at The University of Texas Marine Science Institute and its Mission-Aransas Reserve are the lucky recipients of a “golden ticket”. It’s not a giant candy bar, but to scientists it’s even better – a $1,650 instrument called the CR1000X datalogger, the next-generation datalogger of the CR1000 series. Campbell Scientific Incorporated created the golden ticket award to celebrate the 100,000th CR1000 datalogger shipped from their manufacturing facility in Logan, Utah. This datalogger stores valuable weather information that the Mission-Aransas Reserve records. Prior to Hurricane Harvey, their weather station was located on the University’s research pier in the Aransas Pass ship channel. The pier, along with the weather and water quality station, was destroyed after a drilling rig ship broke loose from its moorings and slammed into the south jetty and the research pier. “This gift of the “Golden Ticket” with a free CR1000X could not have come at a better time,” said Dr. Ed Buskey, professor and Mission-Aransas Reserve research coordinator. The weather and water quality station was a vital source of information. Prior to the hurricane, it collected weather information real-time 24-7. The CR1000X is an integral component of that system. “It’s like a minicomputer that transfers the weather information we’re collecting from the air into a digital format we can read by simply going online,” said Buskey. “The Mission-Aransas Reserve is a valued customer and we’re thrilled to be able to gift the datalogger to researchers in need,” said Evan Campbell, Campbell Scientific founding partner. 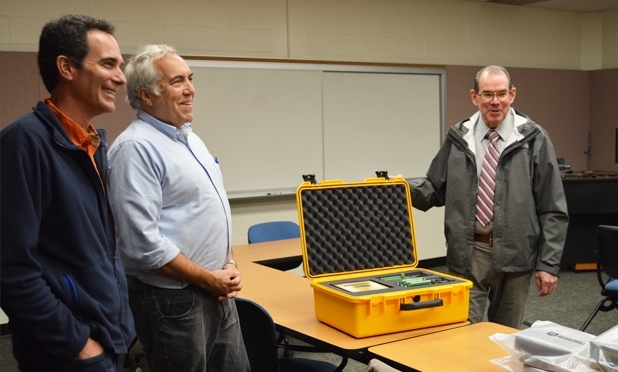 Campbell Scientific will be collaborating with the scientists to document the journey of this “Golden Ticket” datalogger from installation to data collection.